Why not let your children decorate their crowns with gems, pearls and all their favourite embellishments! Let their creativity run wild to create the perfect head ware for your little prince or princess. 1. Print the free printable kids craft crown templates and cut the template out. 2. Use the crown template to cut out a piece of Dovecraft foam there are lots of colours so you can choose your favourite. 3. Decorate the crown by adding a yellow enamel dots to the central circle and orange enamel dots to the smaller circles. We have then added small yellow enamel dots to the bottom of each triangle. 4. Cut a piece of ribbon to the circumference of the child’s head adding an extra 20cms for tying. Cut the edges diagonally to create smooth edges which are less likely to fray. 5. Add double sided tape to the back of the crown on the bottom edge and add the ribbon over the top ensuring the ends are loose so you can tie a bow and secure to your little prince's head. 1. 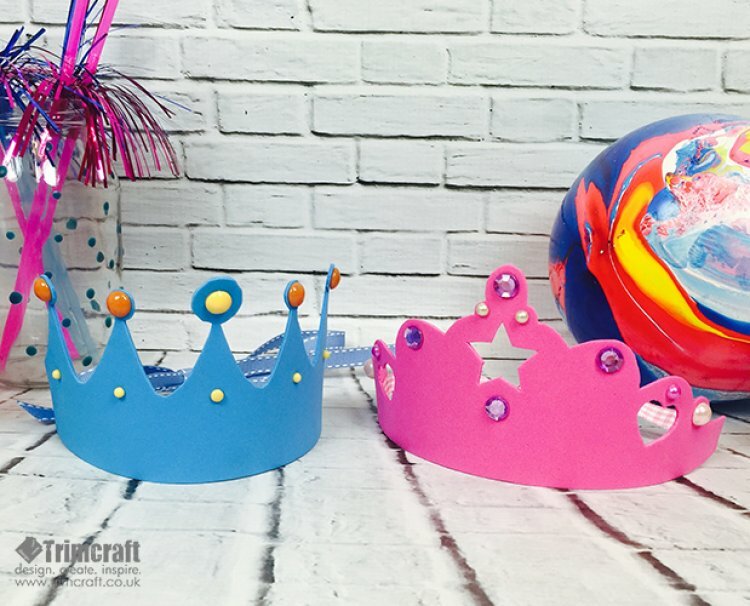 Use the heart and star tiara template to cut out onto a piece of colourful foam. 2. To decorate, add a large purple gem to the top of the crown and then two small cream pearls below it. 3. We have then added a large purple gem below the star cut out and another two gems adjacent to the star. 4. Above the heart cut outs, add two small pink adhesive pearls and stick two cream pearls to the final curve of the crown. 5. Add double sided tape to the back of the tiara on the bottom edge and add the ribbon over the top ensuring the ends are loose. Place on the princess's head and tie a bow to secure. We would love to see how your children have decorated their crowns so remember to share your pics on our social media and upload them to our project gallery.